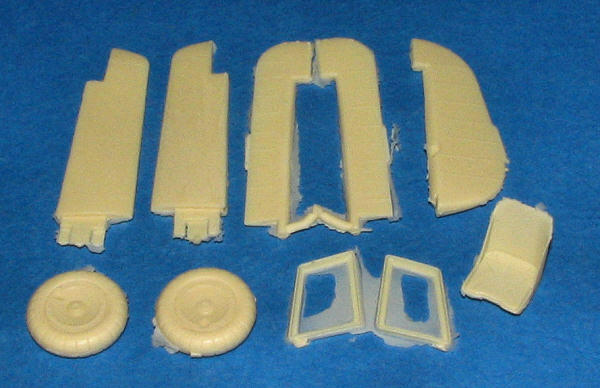 If you have the Hasegawa 1/32 FW-190A, then you'd be interested in this set. It includes a new seat, new rudder, new horizontal stabs and elevators so you can pose them in something aside from the neutral position. It also includes ribbed tires and a set of frames for the 'Rammjaeger' version. There are templates given so you can also provide the external scabbed armor for these aircraft. The set is easy to use. Simply clean the thin flash and glue them in place as they are direct replacements for the kit parts. Full instructions are on the back of the header card. Thanks to Loon Models for the review sample. You can get these from www.rollmodels.com or your local hobby store. If they don't carry them, ask for them.